Thanks to the classic French dessert recipes below, you can make the authentic French cremes and dessert souffles once enjoyed by Napoleon III and the Imperial Family of Russia. 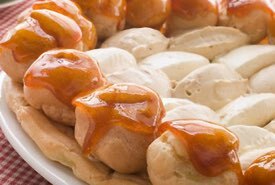 These historical desserts are creamy smooth and feature that delicious melt-in-your-mouth taste that the French are famous for. Absolutely Delicious! 1/2 pound chocolate, 1 quart milk, 6 tablespoonfuls sugar, 2 tablespoonfuls cornstarch, 6 yolks. 1/4 pound chocolate, 1 glassful water, 1 tablespoonful cornstarch, 1 glassful cream or milk, 4 yolks. Chocolate sauce preparation: (1) Melt the chocolate in 1 glassful water. (2) Place the yolks in a saucepan with 1/2 glassful cream, and warm a little; add 1 tablespoonful starch mixed with 1/3 glassful cream, and add the chocolate while stirring; warm again, but don't let boil; cool and serve with the Creme au Chocolate. For five persons. 5 eggs, 3 tablespoonfuls flour, 2 tablespoonfuls sugar, 1 pint milk, the yellow rind of 1 lemon, a little vanilla, fat enough to fry. Preparation: (1) Take 3 eggs, 3 tablespoonfuls flour, 2 tablespoonfuls sugar, the zest of a lemon, or some vanilla, mix all together. (2) Add little by little and while beating, 1 pint boiling milk, till you obtain a thick pap; allow it to cook for 10 minutes, always stirring. (3) Pour this on a plate in a 1/2-inch layer and let it cool. (4) Cut the cold pap in cakes, steep them in 2 beaten eggs, roll in bread crumbs and fry. (5) Serve on napkins, with granulated sugar. Proportions for five persons. Prepare this classic French dessert recipe the same as Creme au Chocolate, but use 4 tablespoonfuls coffee for the cream and 2 tablespoons coffee for the sauce. 3 eggs, 1 pint milk, 1/2 pound sugar, 3 tablespoonfuls flour, a little vanilla, the yellow rind of one lemon. Preparation: (1) Break 3 eggs, put the whites apart and the yolks in a saucepan. (2) Add in this saucepan 1/2 pound sugar, 3 tablespoonfuls flour, some vanilla, the yellow peel (zest) of a lemon, 1 pint milk, allow it to cook while beating till thick enough (about 10 minutes). (3) Beat the whites and pour in the saucepan little by little. (4) Pour the whole in a buttered cake mold, and allow it to bake in an oven (not too warm) till it swells, and has a nice, yellow color. Serve with some granulated sugar sprinkled over it. Proportions for five persons. 1/2 pound oat meal, 1/4 pound sugar, 1 tablespoonful butter, 1 pint milk, 3 eggs, 1 tablespoonful baking powder. Preparation: (1) Mix in a saucepan 1/2 pound oatmeal with 1 tablespoonful butter, 1/4 pound sugar, 1 pint milk, some vanilla, or the yellow rind of a lemon, and cook slowly for 10 minutes. (2) Put the saucepan on the corner of the range and add, while stirring, 3 eggs and 1 tablespoonful baking powder. (3) Pour the whole in a buttered cake mold, and allow it to bake in an oven (not too warm) till it swells, and has a nice yellow color. Serve with some granulated sugar sprinkled over it. Proportions for five persons. 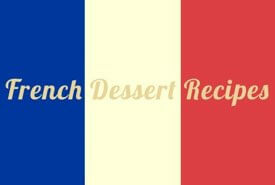 Despite its longer preparation time, this is THE classic French dessert recipe to make for any special occasion. A traditional French dish that's sure to impress. One quart of milk, half a cupful of sugar, half a teaspoonful of vanilla extract, half a teaspoonful of salt, seven eggs, two tablespoonfuls of water. Put the sugar in a small frying pan and stir until a very light brown. Add the water, stir a moment longer, and mix with the milk. Beat the eggs and salt with a spoon. Add this mixture and the vanilla to the milk. Butter a two-quart Charlotte Russe mold lightly, and put the custard in it. Put the mold in a basin of warm (not hot) water and bake slowly until the custard is firm in the center. It should take forty minutes; but if the oven is quite hot, it will be done in thirty minutes. Test by putting a knife down into the center, for if the custard is not milky, it is done. Set away in a cold place until serving time. It must be ice-cold when eaten. Turn out on a flat dish, and pour caramel sauce over it. This classic French dessert recipe hails from the Medieval Era, and the pastry's deep-fried lightness inspired its unusual name: pets-de-nonne which translates as Nun's Farts! 2-1/2 cups water, 3 ounces butter, 1-1/4 ounces sugar, a pinch salt, grated rind 1 lemon, 1/2 pound flour, 4 whole eggs. Boil together the water, butter, sugar, and salt for two minutes. When the liquid is boiling, remove the stew-pan from fire and add the flour all at once, then the lemon peel. When half-cool add the eggs one by one. Drop by spoonfuls in hot frying fat, which must not be too hot. When a golden brown remove from fire, drain, and roll in fine sugar. You'll enjoy trying these classic French dessert recipes. Cremes are perfect for when you want to serve something delectably sweet that's both tasty and elegant on the table. Choose from the delectable fried cream dish, the amazingly flavorful creme au chocolate, the souffles, or why not go all out and serve the classic Creme a la Versailles. Desserts that were once enjoyed by European royalty. Be forewarned that you'll need to experiment and practice somewhat, as souffles are not the simplest of desserts to make. But, in the end you'll impress your friends with your new dessert making skills.